As Anyone Had A Test Ride On A r1200rs. How Did It Compare To The XR.?? Yep. The RS is a great bike. But not really comparable to the XR. Here is my personal take on the RS written for some mates. 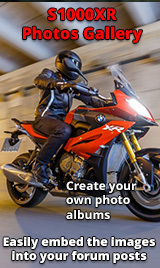 "I was loaned a new BMW R1200 RS for a couple of days. Mildly interested as always to ride a new bike I was, well just that, mildly interested. Until I had ridden it. What an absolute hoot - a megatastic barking blitz of a bike. It has the now normal 1200 water/ air cooled boxer engine which, if the GS and RT are anything to go by, puts out about 120 BHP and lots of torques. But the RS is either much lighter or lower geared (or perhaps both) than either of its forbears because it is really quick. Not searingly eyeball popping ballistic like the XR but light, lithe and limbo-like nimble. It’s a long time since I’ve ridden a supersports bike but the RS feels very quick steering, even sportsbike like, much as I remember the early Fireblades. But very stable at the same time. I don’t know how BMW have worked that particular magic - maybe it is junking the stability of the Telelever front end for weight saving in favour of normal forks, but whatever they’ve done, it works. The RS is quick, nimble and beautifully balanced in corners. I found that I was taking familiar bends 10 mph quicker than normal on the RS because it felt so perfectly stable at big dangle angles. I am amazed and very, very impressed. I was always a fan of the old R1200 R as an underrated bike but this RS is in a different league. Hell, it is Premier against Sunday. I would however add a caveat here because I’ve not ridden the new R1200R. I did find it a bit tucked up in the knee department even with the high seat (a little like the Moto Guzzi Griso 1200 in fact, although that manages the magic trick of being comfortable at the same time). I found the bars a comfortable stretch although the neck aches a bit from having to look up a bit more than normal for hours (although far less than on a sports bike). Probably me getting old(er). However the screen (again limited to 2 positions of down and – er – up?) made a horrible roaring noise and in either position fed air turbulence direct to the helmet region, with the “up” position being notably worse. What is it with bike manufacturers? Why can’t they make wind, noise and turbulence one of the prime cockpit issues and provide different screen designs that work for different height riders. Of all the comfort and safety issues they spend squillions on (e.g. ABS, TCS, electrical gearshift power modes, active this and that, various seat configurations etc etc, ad infinitum), surely the mind numbing and deafening air noise and vibration to the head at speed is one of the easiest ways to make reaction times slow and the present-thinking part of the brain reduce in focus. Wouldn’t it be nice if when buying a new bike (and let’s face it, most are close to new car money now, so it is for most people a pretty big long term investment) the customer is offered a test ride with a choice of screen configuration as opposed to the current situation of liking a bike with some misgivings which you then have to solve (if you are lucky) by trial and error in the after-market parts lottery. Anyway, off me soap box and to finish on all praise for the RS. Brilliant bike let down by its screen. But at least the seat is comfortable ……"